Today’s freebie is a play on some of the “quick contact forms” I’ve come across in recent designs – a modal box contact form. 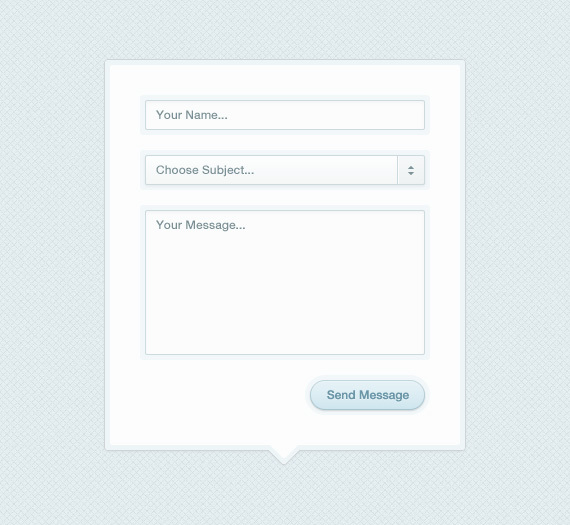 In this design I’ve moved the form inside a modal box which could be triggered by clicking a “contact” button for example – perfect for saving valuable space. While I’ve used a form, the modal could be used for virtually anything, adding notes, viewing lists, dropdown menus and so on. Click the image below for the full size version and enjoy the download! Now if only there was a clear way to apply such effects with CSS. I think the only way to style a select box is JS or something right? What I would do is create an unordered list and style it accordingly. Then use JS to populate a hidden field with the selected value when clicked. the background patterns you use are simple and elegant.. I love it. Thank you so much. Simple and clean. I wish http://www.quickwebform.com will use this as a template. I will let them know. I have been using them for contact form because it comes with database. It’s also free. Not sure if you have heard of them before. Anyways, thanks again! I would love to know how you create these cool backgrounds to display your stuff. Thank you! Love your work Orman!